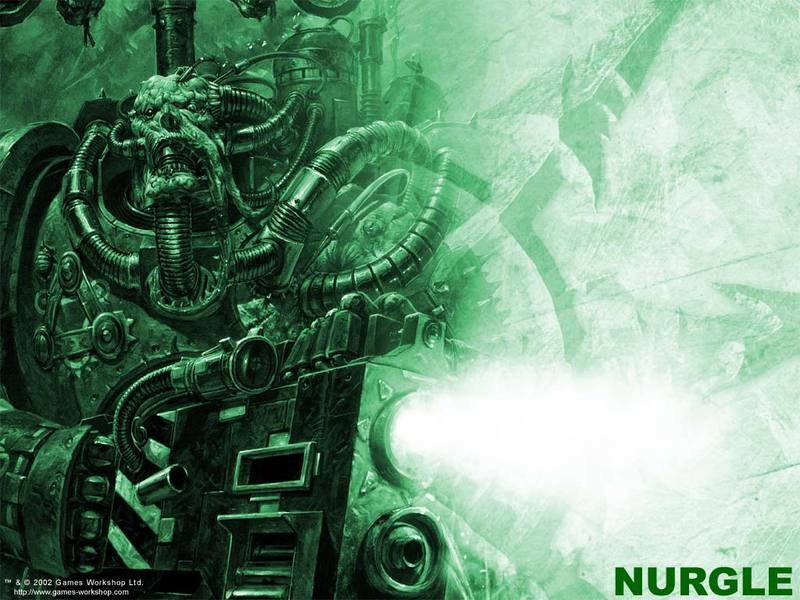 Hey everyone, I've got another nurgle list for you. This one is taking advantage of Epidemius as an Ally. When he is on the board, any model killed by any follower of Nurgle (daemon or simply marked unit) adds to a tally. Once the tally reaches certain levels, bonuses are bestowed on those units. The bonuses are amaaaazing, like all followers now wound on twos, or all attacks made from nurgle followers ignore armour saves (shooting included). Im going to include the chart for clarity. With this in mind, I want to set about building an army that will build that tally fast, and have the right models benefit at the right time. I like looking at this army concept like a 2-stage rocket. First, you need your shooters to pump up the tally so your close combat units wound on 2's who, in the second stage, will vault the tally up to the fnp boost and all attacks ignore saves buff. Fortunately, Mr. Kelly made it so everything and their moms can get marked in the new book. The first things that jump out at me are the Obliterators. Marked with nurgle, they are 76pts a pop but can give me the utility to open transports or drop plasma cannon templates on the enemy. I want 2 units of two. I also am really liking bike lords this addition, and with the mark of nurgle this guy is toughness 6. The Burning Brand of Skalathrax is a torrent AP3 flamer template so with bike movement and the 12" torrent range I can really put some early pressure on the enemy. He doesn't need anything defensive because as long as he's moving he has a 5+ cover. The chaos lord needs a body guard of some kind who can keep up then detach to pummel in close combat and boost that tally rapidly, especially if they are wounding on two's. I really dig spawn in this codex, and they can be marked. Toughness 6 beasts with rage, fearless and lots of damage potential. 2 units should work fine. The real benefactors of all these buffs are plague marines. With all those buffs, they'll be unstoppable by the time they hit midfield around turn 4. I also want a suitable bodyguard for Epidemius because if he dies those perks disappear. He's fearless so all I want and can afford at this point are cultists to jump in front of him. I also want another unit to sit around and take an objective. We can't forget about Epidemius and his Plaguebearer tax. Under the daemonic assault rules, independent characters can join units in reserve and be treated as a single unit for splitting purposes so I'm guaranteed to get him first turn. So they'll deepstrike somewheres in my backfield and then 2nd turn epidemius will join the clutist blob, while the plaguebearers shamble towards another local objective. Adding it up, 1886. One spawn is 36pts, how convenient. Consider him dropped. The lord will run with the smaller unit to equal the killing power. I think this style of army is going to be really hard to deal with. Actually, don't you think it could be worthwhile to find the points to mark the cultists? I don't think its good idea to mark them in this build. At 2pts per model, the nurgle mark is really expensive for models that should never leave your deployment zone. There are builds that can suit this but the will not gain the same benefit plague marines do. I was informed that daemon independent characters cannot join allied units regardless of battle brothers, so I have some tweaking that needs to be done. That plaguebearer unit needs to be much bigger to keep Epidemius alive. Im gonna drop gift on the lord, the big cultist squad altogether to make the plaguebearer unit 14 strong. Have you considered maybe trimming a couple plague marines (I think units of 10 are still very strong) to get more cultists on the table? You have a good amount of threats, I just question your ability to take objectives. This is balanced by your strong ability to deny other scoring units, but still something that bugs me a little with this list. I could drop 2 Plague Marines from each unit and a plaguebearer and add 2 10 man cultist squads. I want to keep the force semi fluffy so that people dont freak out too much when their models are being pulled off the board in droves. "oh, at least he's playing with the sacred numbers." I can dream right? I wont play this list with the new daemons codex coming out in january supposedly. Im still trying to work out the bugs of the chaos dex. Im coming to the conclusion that the troop units blow, cult or otherwise. Which is unfortunate.